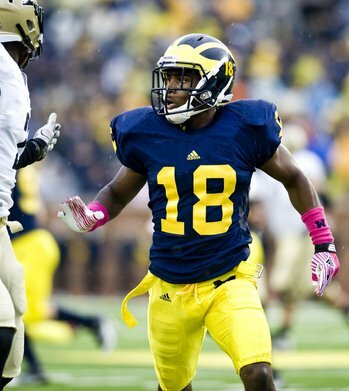 Posted on Tue, Apr 3, 2012 : 11:03 p.m.
Blake Countess is as cool a player as the Michigan football team has, despite being an 18-year-old sophomore. But there is one thing that rattled him. "The dumbest guys on the team are the freshman," coach Brady Hoke told him, "and the biggest problems are sophomores that played as freshman." Michigan cornerback Blake Countess (18) says he is focused on bulking up for his sophomore season. Countess was neither dumb nor a problem as he burst onto the scene last year as a true freshman cornerback. He turned 18 only two days before the start of fall camp, but played like a veteran after being thrust into action in the fourth week of the season against San Diego State. Countess' playing time escalated in the next three weeks before he supplanted Troy Woolfolk as the starter against Purdue. Woolfolk, a senior, was moved to safety. The Owings Mills, Md., native started the final six games, joining the select company of players such as Donovan Warren, Marlin Jackson and Charles Woodson as freshmen who started at corner for Michigan. Countess broke up six passes, the most by a Michigan freshman since Jackson deflected seven in 2001. He also recorded 44 tackles and forced one fumble, and was named to multiple Big Ten all-freshman teams. But sophomore slumps happen, and Hoke is making sure Countess doesn't grow complacent. "Coach Hoke picks at me, and I took that to heart a little bit," Countess said. The concerns about a sophomore slump carry some weight after Countess struggled to sustain his hot start last year. He played poorly in the regular-season finale against Ohio State, whose woeful passing attack shredded Michigan's secondary, and again in the Sugar Bowl against Virginia Tech. Countess said his struggles stem from a case of "bad eyes" -- in other words, poor reads. He is working to correct the issue with intensified film work. "As you get older, you become more comfortable with the defense, so now you don't have to really focus on the plays (as much)," Countess said. "You can focus more on watching film and game planning." Countess also is trying to bulk up his slight frame, which could help him hold up better late in the season. Listed at 5-foot-10 and 176 pounds, he said he now weighs about 180 pounds and wants to add a few more pounds before fall. "This is the Big Ten," he said. "It's a big conference." Something that could aid Countess' development is the consistency of Michigan's defense, which will feature the same 4-3 scheme it ran last year. The Wolverines haven't employed the same defense in consecutive years since the Lloyd Carr era. In the defensive backfield, Michigan returns seven of its top eight players. Only Woolfolk is departing. Starting cornerbacks Countess and J.T. Floyd return, as well as top reserves Courtney Avery, Raymon Taylor and Delonte Hollowell. This spring, junior Terrence Talbott has apparently risen into the mix too. While the Wolverines' practices have been closed to the media, a video published by MGoBlue.com shows Talbott running with what appears to be the first team. "I just know we got a lot of guys and we're competing every day," Countess said when asked about Talbott, who played in only two games last year, both on special teams. "We're getting better and we're pushing each other. "I wouldn't say it's one guy, but Terrence is going to push J.T., or Terrence is going to push Raymon, and they're going to push me, and I'm going to push Delonte. We just work as a group." It's a group loaded with experience, led by one precocious sophomore. Thu, Apr 5, 2012 : 1:28 a.m. Hearing about position battles is a great thing! Go Blue! Wed, Apr 4, 2012 : 4:35 a.m.